Featured throughout this website are some of the worlds most unique and collectible limited editions created by Michael Hunt. The vast majority of these fine art prints have been autographed by some of the worlds most well known celebrities his art is available in more than 40 countries worldwide. 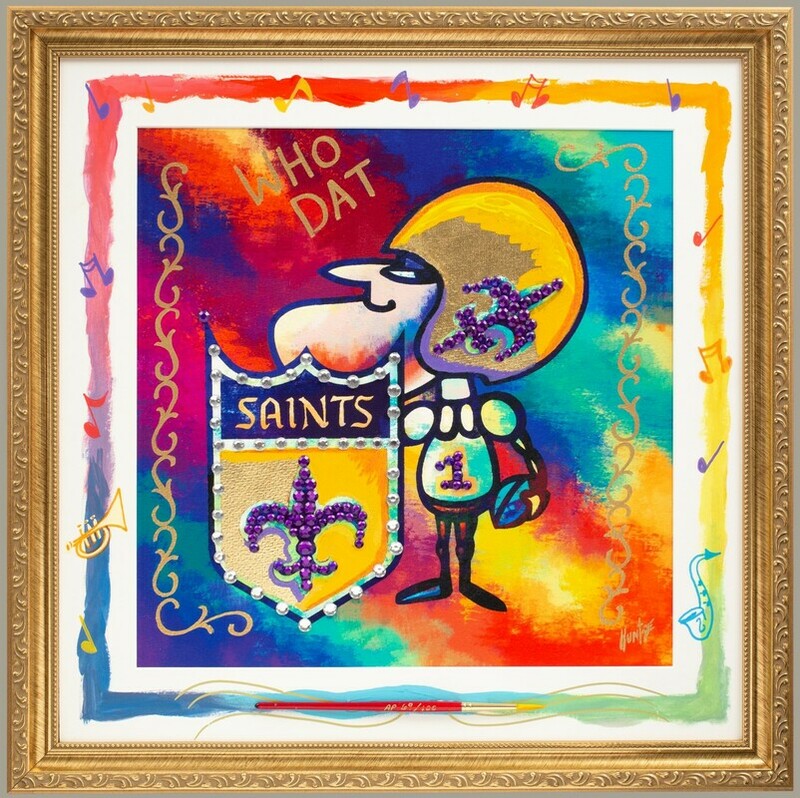 Created as a tribute to the WhoDat nation and inspired by the unjust call against the Saints. This print is not simply a work of art but rather a historical tribute to the fans each has been personally hand signed and numbered by Michael.​ Size unframed 16" x 24". Limited to only 250 Hand remarqued prints each features a different remarque making each print one of a kind. Size unframed 16" x 24". Numerous crystals and rhinestones have been hand applied to this print, making it the most exclusive and valuable version in the addition a custom remarque has also been added by Michael Hunt. Do to the effort of creating each piece currently only 10 have been created. This stunning version is destined to sell out quickly. For additional information please call 504-392-2700 or 1-800-426-1379. Available exclusively framed as shown. Get yours while they last! arrive custom framed as shown. 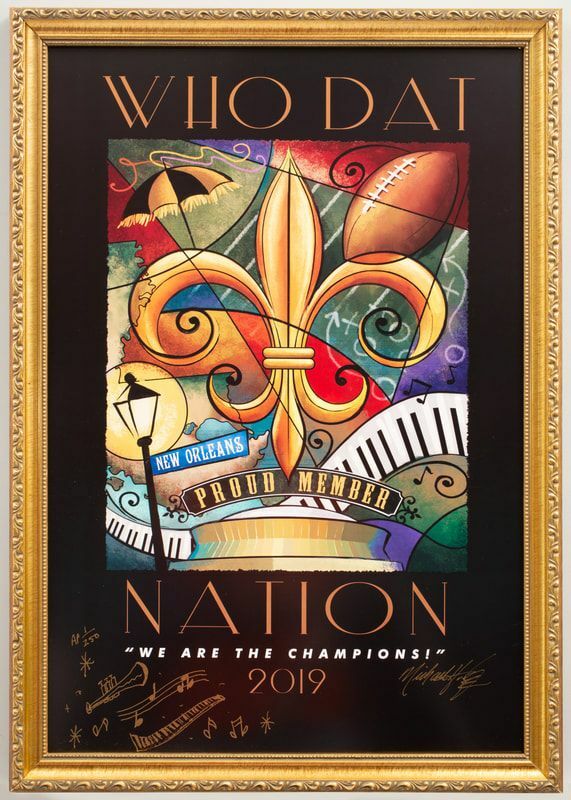 ​​Size: 25" x 17"
This historic limited addition has been individually hand signed by artist Michael Hunt, Will Smith, Marques Colston, Lance Moore and Deuce McAllister. Each player was on the field when the historic punt was blocked. A Certificate of Authenticity will arrive with your artwork. Passing King Special Edition: Created as a tribute to Drew Brees breaking the all time passing yards the title was broken Oct 8th, 2018 with 72,103 yards. 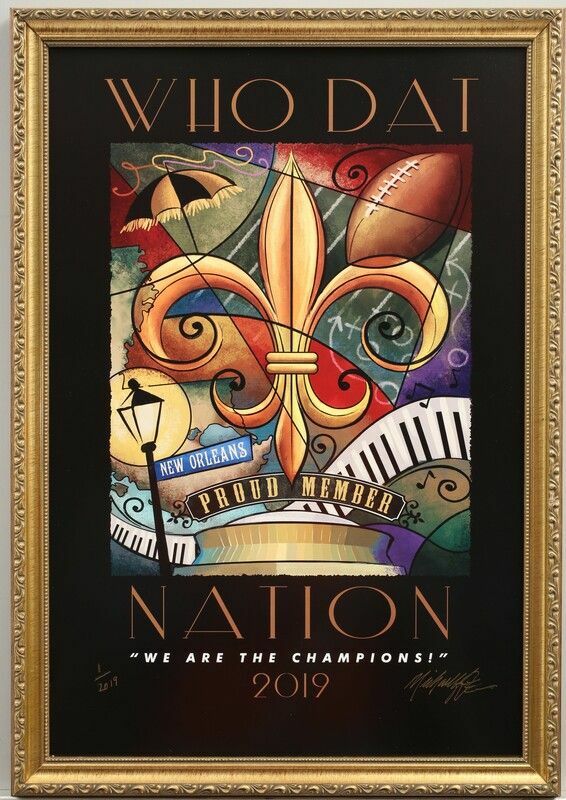 Limited to only 100, this historic lithograph is available unframed for $75 or framed as shown for $175. For more information please call 504-392-2700 or 800-426-1379. Featuring a hand painted border, real 18k gold leafing, crystals and rhinestones along with individual works of art throughout, your art piece will arrive with the actual paint brush used to create these images. Because each piece is unique, no two will be the same. This art piece is only available framed as shown. Size: Approx 15.5” x 15.5"
This 11" x 14" lithograph is perfectly sized for any bathroom. 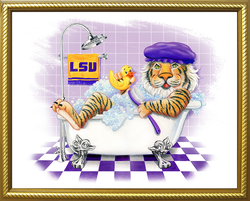 You and your guests will love this humorous depiction of Mike relaxing in his bath! 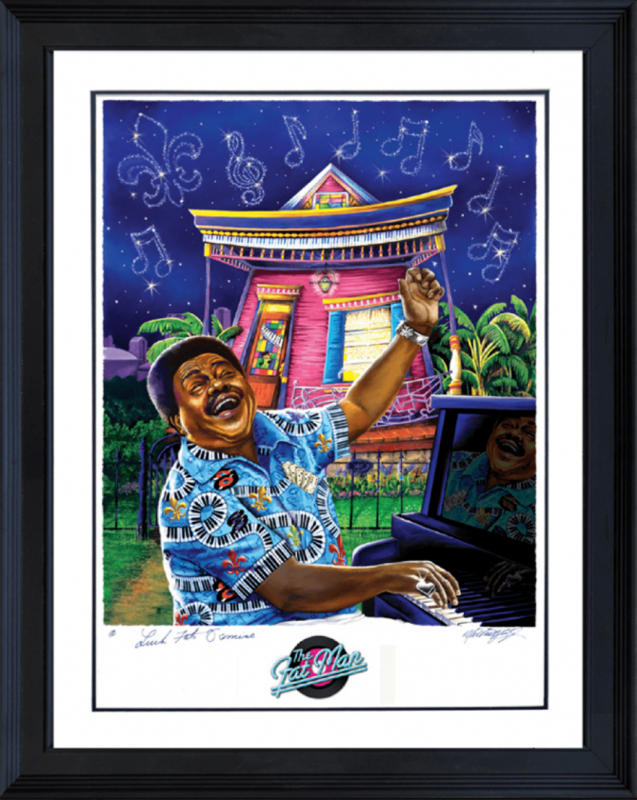 Michael Hunt has collaberated with the mystical master of voodoo funk, Dr. John to create one of the music world's most unique prints individually numbered and hand signed by the Dr. himself. 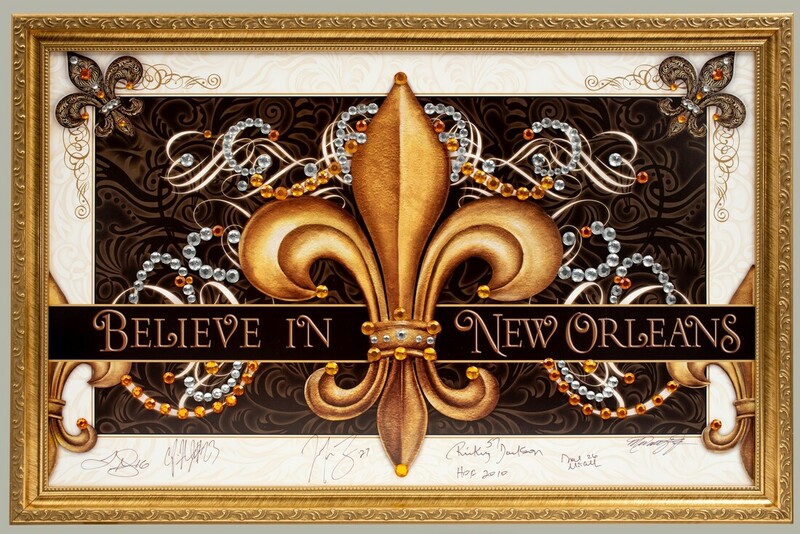 Autographs from Dr. John are extremely rare due to his finger being partially shot off during a New Orleans bar fight. In the years since it has become increasingly difficult for him to sign his name. This adds to the value and exclusivity of this fine art print. With Extensive Crystal Accents and Real Gold! Hand-signed by the artist who created the original painting! Hand -signed by Fats Domino!